Hello and welcome. 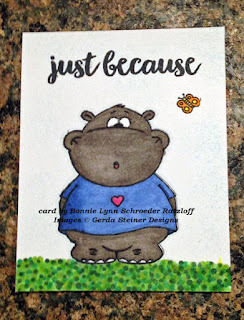 Today I'd like to share a card made using another digital stamp from Kinda Cute by Patricia. This one is called Gnome and Mouse and is just darling and can be used for all sorts different occasions. Once I printed off the image, I colored it up using both prismacolor and copic markers before stippling Tim Holtz tumbled glass distress ink around the edges then layering. For the grass I sponged Adirondack lettuce dye ink before adding some "faux brads" by punching out four small circles then adhering them using a Martha Stewart glue pen. I then grabbed some scrap designer paper, adhered it to my card, then sponged lettuce dye ink around the edges of the card. The only embellishments added were some forgotten scrap ribbon and butterfly sticker that have been in my stash for years. 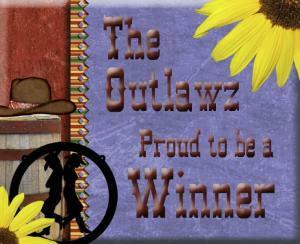 I'm really happy with how this turned out since I made it while still dealing with my migraine. Hi there. Did I make you smile?? Who wouldn't want to smile after seeing this cute flamingo. It's from Gerda Steiner Designs and is called Upside Down Flamingo and is perfect for any type of card. The saying is from Hedgehog With Sign set. Both are sets I haven't used. I stamped the flamingo in memento black ink onto white card stock then colored using copic markers before stamping the saying in the upper right corner. 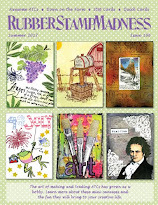 For the sand, I repeatedly stamped the fern from Stampin Up's retired Watercolor Minis in various brown dye inks. 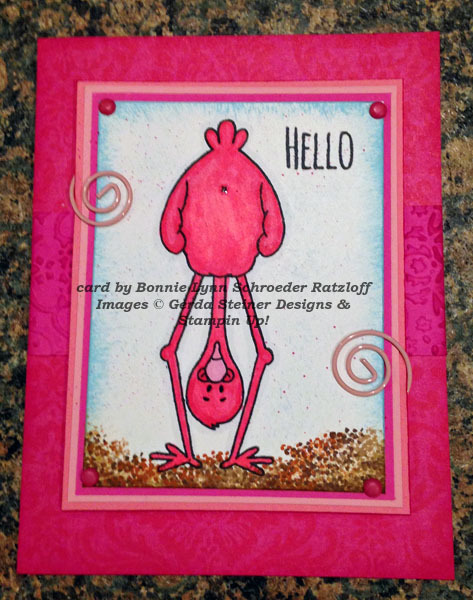 After adding a panel of Colorbok Light Bright designer paper, I added an embossed border then sponged the card edges with pink passion dye ink. I then highlighted parts of the flamingo using a black Sakura glaze pen. The only embellishments added were bright pink brads and pink circle clips. Hello and again...welcome. Second post for me today. If you're looking for my Hippo and Butterfly post, please scroll down one. 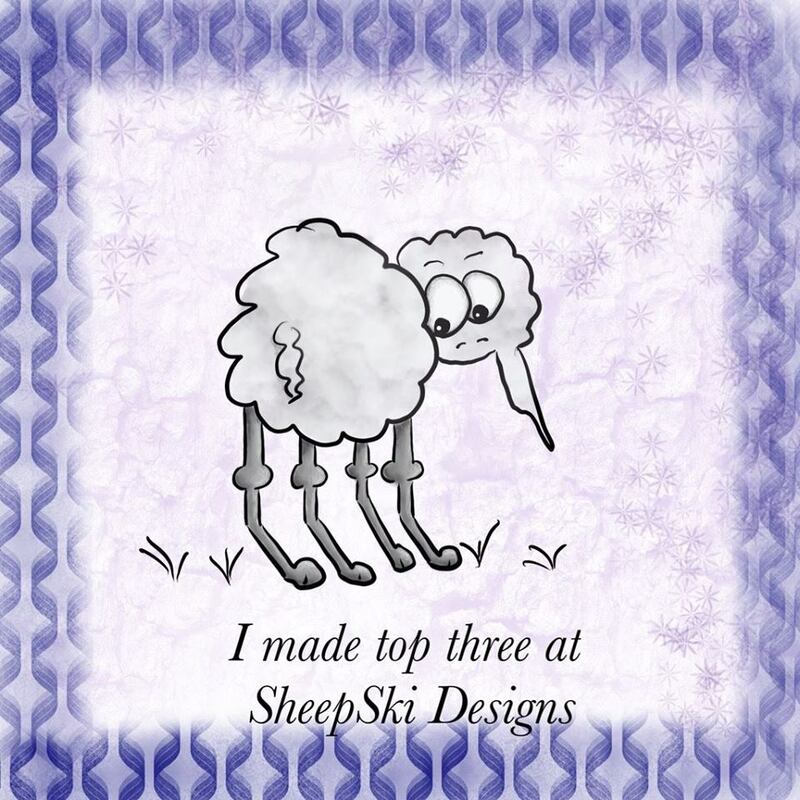 I'd like to share with you a card I've made using a never before used digital image from Kinda Cute by Patricia Alvarez. The image is actually a freebie and can be found here. After downloading and printing off the image, I colored it using both prismacolor and copic markers. I then stippled some Tim Holtz brushed corduroy and tumbled glass distress inks over and around the image. I love the way stippling gives a "softer feeling" to an image. I then drew the "tree branch" before pulling out my long retired Watercolor Minis set from Stampin Up to stamp the "trees leaves"; another favorite technique. 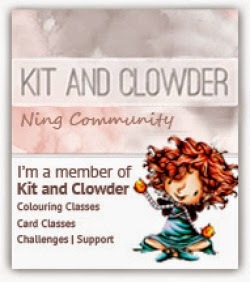 Once everything was colored up and layered, I added some white brads before adhering the image panel to my card. I then stamped the saying before punching it out using oval punches. I then highlighted some areas using Sakura glaze pens. The only other embellishment is some sparkle dew drops otherwise I kept the card pretty much clean and simple. Hello and welcome. 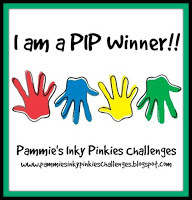 Did you know that stamping or coloring is a real pain in the booty with a migraine? Well now you do. 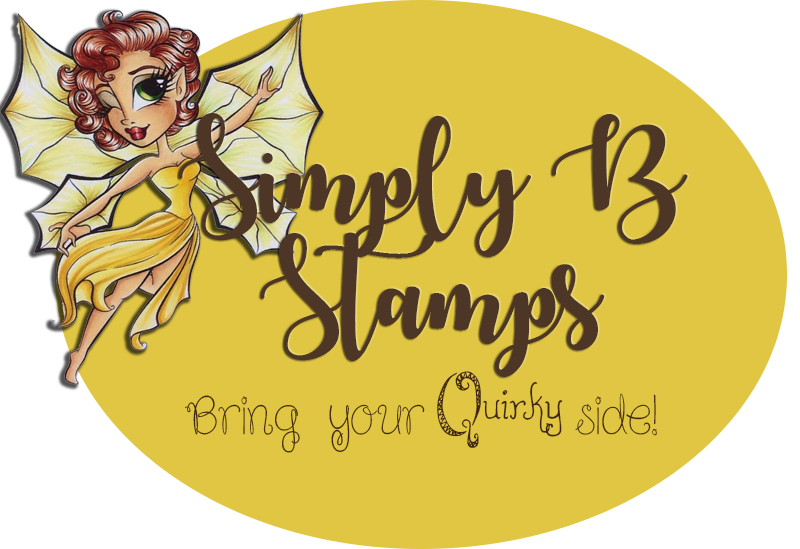 I wanted to make a card to send to a fellow migraine sufferer and figured this never before used (NBUS) cute stamp set I won from Gerda Steiner Designs would be perfect on a clean and simple card. 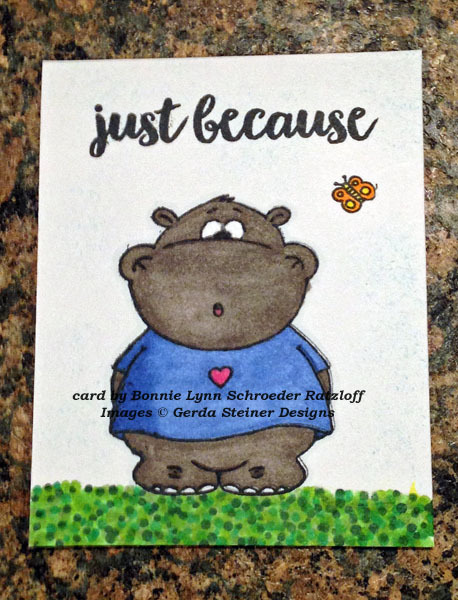 I started off by stamping the hippo and saying from the Hippo With Butterfly set in memento black on scrap white card stock; just big enough to create a small card. 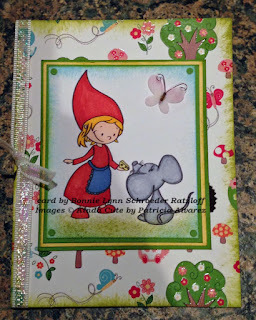 I then stamped the little butterfly and colored everything using copic markers including creating the grass with them. 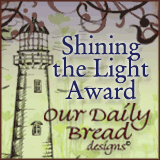 I then stippled some Tim Holtz tumbled glass distress ink light over and around the card. Hello and welcome. 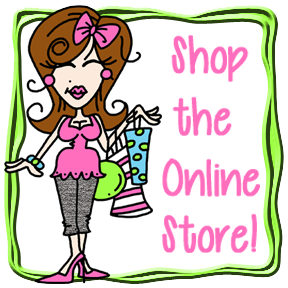 If you're looking for my Friend-ship post, please scroll down one. So far I'm still doing good on getting at least one Christmas card done per month, sometimes two. For this card, I stamped the image from my never before used (NBUS) Cardinals In Winter set from Mark's Finest Papers which is unfortunately now closed. Once I stamped the image in memento black and colored using copic markers before stippling Tim Holtz tumbled glass ink around the edges of the panel and layering. Once that was done, I made my own brads by punching a snippet of scrap black card stock and adding using a Martha Stewart glue pen. I then stamped the saying on a snippet of white card stock before punching using my Stampin Up oval punch and lining with memento black ink. After assembling my card, using Martha Stewart punches, I made my floral spray and cardinal from snippets of green and red card stock; adhering them with glue dots. I then added the cardinal's eyes/beak using a Sakura black glaze pen. 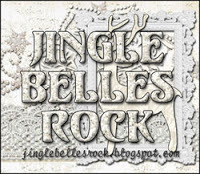 My final touch was highlighting the snowbanks, frozen creek and "falling snow" using diamond ice stickles. Hello and welcome. The calendar says it's spring but so far the weather isn't cooperating to much here. We have another cold "winter" storm coming in tonight again my migraines are not happy. I originally started this card for another challenge 3 weeks ago, but with all of the frequent storms and temperature changes it's taken me until now to color and actually finish it; let alone blog it. I started off by stamping the tug boat, trees and clouds using Stampin Up's Loads of Love and Boatloads of Love (both retired) in memento black ink before stamping the smaller boat with heart onto white scratch paper then colored everything. 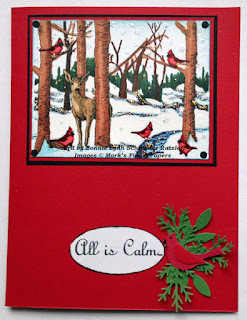 Once the coloring was finished, I stamped the grass in 3 different inks using fern stamp from Stampin Up's retired set Watercolor Minis before doing the same for my riverbank. I then created the river using 3 different copic markers before stippling 3 different inks around the edge of my image panel. 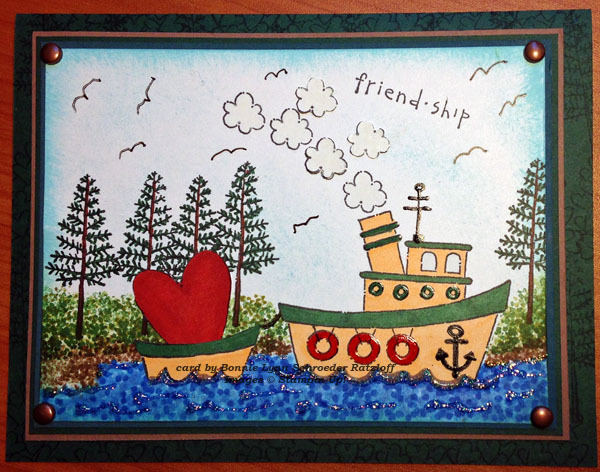 I then cut out the smaller boat and heart and added them to my river scene. 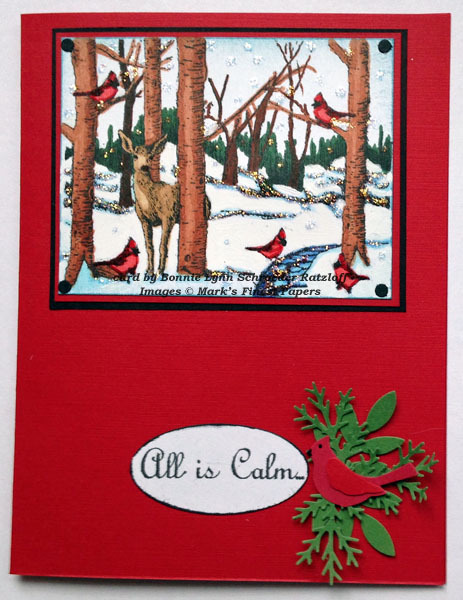 The card is stamped using the same tree and some more hearts in hunter ink. I then stamped the saying before highlighting portions of the boat and "birds" using Sakura glaze pens. As an afterthought, I stamped 3 more clouds onto white scrap paper, colored using a Recollections white marker and cut out to pop up for some added dimension. My final touches were brads and waterfall ice stickles. Hello and welcome. 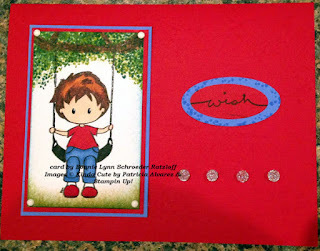 Today I'd like to share a sympathy/hugs card. Unfortunately, I'm needing a lot of those lately. It took me several days to make since my mojo has taken another unauthorized "leave of absence". I started out by stamping four WP846 Watercolor Butterflies from Impression Obsession on scrap white card stock in some rarely used (RBUS) Versamagic mango and thatched straw chalk ink before fussy cutting two of the butterflies out to pop up later. I then stamped the love and prayers words in the same chalk ink onto the uncut panel before stippling Tim Holtz wild honey and spiced marmalade ink on the side and over the stamped images. I then spritzed some orange ink over that using a color spritzer tool and an orange marker. After layering the image panel, I added some punched some "faux brads" using punched circles and a glue pen. 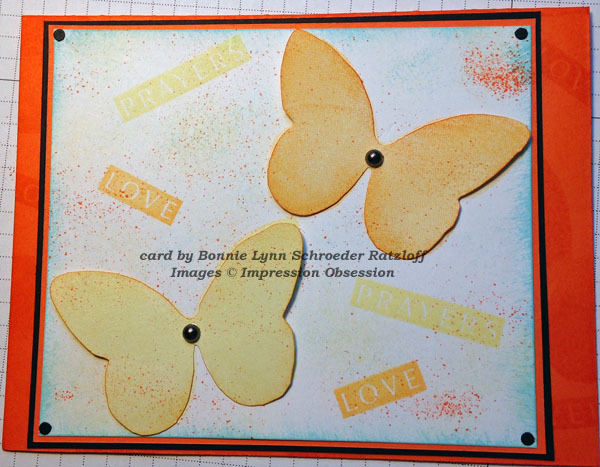 For the card, I stamped the background using images from the same Watercolor Butterflies set in memento tangelo ink before stippling spiced marmalade around the edges. I then added my fussy cut butterflies to the image panel using glue dots before adding black pearls to the center of the bodies. 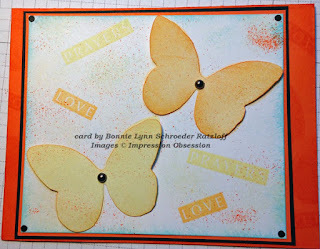 My final embellishment was spritzing the orange marker ink over the popped up butterflies.